I was tidying the desk where the computer sits (SO much clutter!) and came across a sketch from I don't know where (I know, BAD!) and decided to use it. It was originally an A2 size, but I wanted something bigger...turns out it was TOO bigger as now I don't have an envy to put it in - oh well! The card is 4 1/4 X 9 and it should have really been 4 X 9" because then it would have fit in a business # 10 envy. 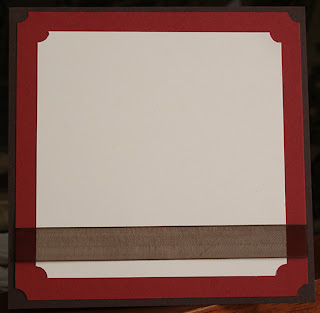 I've got some 12 X 12 cardstock that isn't too thick, so I ought to be able to rig something up. Barring that, it's hand delivery baby!!! The base is a 8 1/2 X 9" piece if Whisper White folded in half. On top of that is a piece of DCWV cardstock that I had in my stash. The next layer is another piece of Whisper White. The images were coloured using my SU markers and then punched out with my 1 3/8" circle punch. 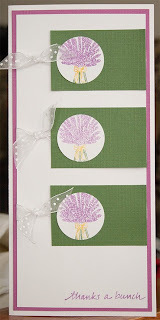 They were placed on pieces of green cardstock from the same DCWV pack. The inside has another piece of the purple cardstock from the DCWV pack and a piece of Whisper White on which I stamped the same image as I used on the front. Here's hoping this is the start of something good! YAY!!! I made a card today! 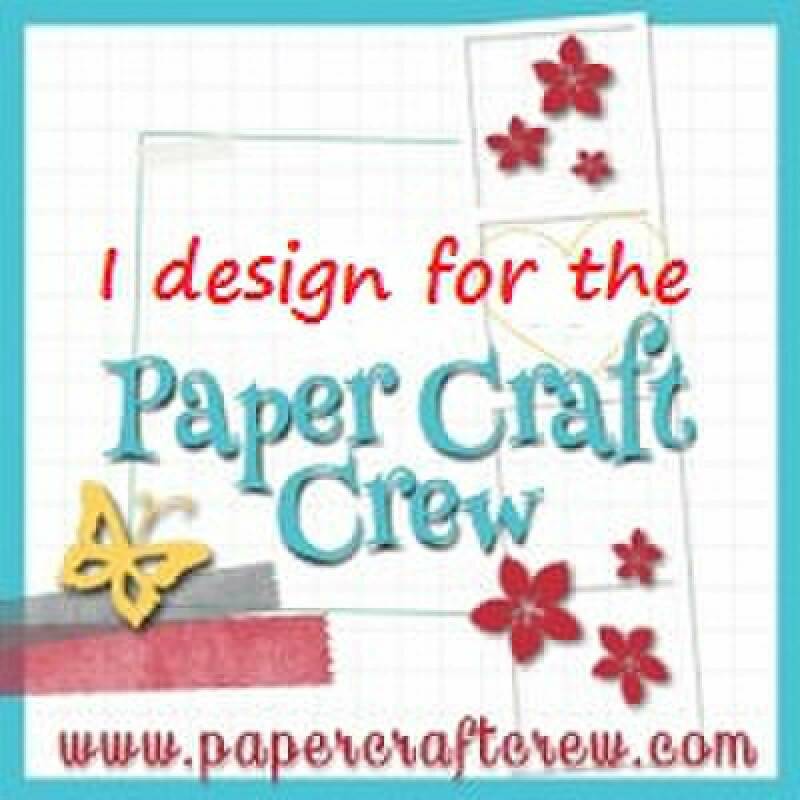 Actually, I made one yesterday too, but I can't show it to you because it's for my DH for Valentine's Day and he reads my blog. I don't want to spoil the surprise! I used the Mojo Monday sketch from the Mojo Monday Blog. 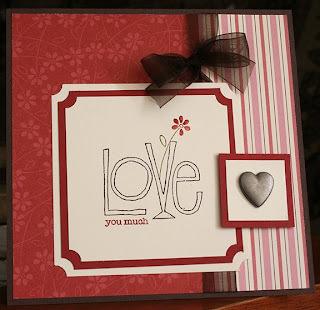 It was a great sketch to play with, especially since I was REALLY wanting to break in to my Candy Lane paper and use the new Love you Much stamp set from Stampin' Up. 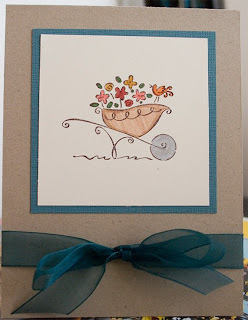 So, I used my SU markers to colour the image and then stamped it on Very Vanilla Cardstock. I mounted the main image on Riding Hood Red and again on Very Vanilla before adhering it to the card face which is two pieces of the same Candy Lane paper (love double sided!). The card base is Chocolate Chip. It's very simple, but it adds just the right finishing touch. Card base: 5 1/2" X 5 1/2"
WOOHOO! First Creation of 2009!